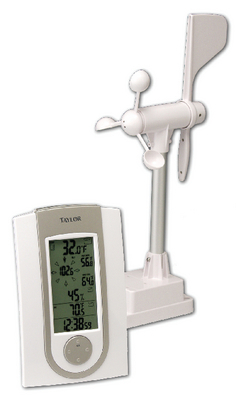 Monitor both wind speed and direction with this instrument that also accurately calculates heat index and wind chill. Minimum/maximum recall for indoor and outdoor temperature is also provided. A backlit five-line LCD screen allows for easy viewing of all readings. Additional features include a clock and calendar and capability to accomodate two additional remote sensors while working with thermometer/humidity functions. Mounting mast and hardware not included. Requires four AA batteries (two for receiver and two for remote sensor), not included. Receiver temperature range: 32°F to 122°F and 0°C to 50°C. Remote sensor temperature range: 4°F to 140°F and -20°C to 60°C. Indoor humidity range: 20 to 99%. Wind speed range: 0–30m/s; 0–108 km/h; 0–67 mph; 0– 58.3 knot; 0 –11 Beufort. Transmission range: 200'.